Laurier’s Alex Anthony (3) is wrapped up by a pair of Queen’s defenders. (Photo by Kate Turner). There’s no worse way to start a season. The Wilfrid Laurier Golden Hawks entered University Stadium Saturday night under the lights with a crowd of first years and eager students, only to lose what subtle momentum they had to a powerful Queen’s Gaels squad. As time winded down, the Gaels quieted the entire stadium, stealing the Hawks’ home opener by a score of 42-16. The young Laurier squad were left empty on offence for the second consecutive game, as they only scored two touchdowns, both late in the second half. 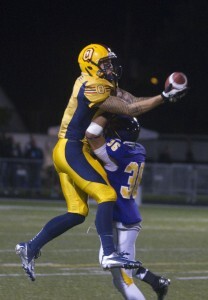 Queen’s receiver Justin Chapdelaine makes a catch over top of Laurier’s Tanner Philip. (Photo by Kate Turner). Quarterback Travis Eman connected with receiver Alex Anthony for the Hawks’ first touchdown of the season midway through the third quarter, and Alex Sanchez found the endzone late in the fourth, but the slight signs of life from the offence wasn’t enough. The Gaels started early when the Hawks conceded a safety, then gave up a 35-yard field goal from kicker Dillon Wamsley. The visitors from Kingston then went on a tangent of offence with four consecutive point gains, taking the lead to 22-2 at the half. Gaels’ running back Ryan Granberg would find the endzone twice with 55 total yards during the game. Quarterback Travis Eman was nine for 21 with two interceptions and 87 yards on the game before Steven Fantham, who was five for 12 and 75 yards, replaced him under centre. Jeffries looks ahead as the team hopes to rekindle their morale as they take on York next Saturday.